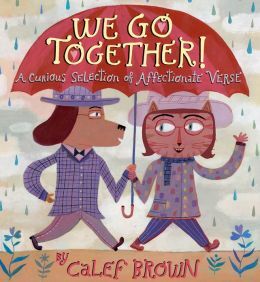 Calef Brown’s We Go Together offers a different twist for Valentine rhymes. In a small illustrated book of 18 poems, this “A Curious Selection of Affectionate Verse” includes a plan for starting a band in the eight lines of “Totally.” Other pals include “Mirth Makers,” “Two Scallywags,” “Two Kiwis,” and more – all accompanied by illustrations of snowmen, roller skating dogs, friendly creatures from outer space (with antennae) or lots of people laughing. Some are silly, but all have the flavor of happy camaraderie. when I get in a tangle. This entry was posted in authors, books, children's books, humor, poetry, reading and tagged A curious selection of affectionate verse, Calef Brown, Holiday, poetry, poetry for children, Rhyme, Valentine, Valentine's Day, We Go Together. Bookmark the permalink.